This has never been true even though there have been times in our history when unscrupulous people have sold indulgences. In fact, the selling of indulgences was one of the things that set Martin Luther off back in the fifteenth century. To explain this, first we have to look at two things: purgatory and then indulgences. Purgatory, according to the Catechism of the Catholic Church (CCC 1030-1032), is the place where souls go to be purified before they can enter heaven. The Catholic beliefs about purgatory were formulated at the Councils of Florence (1431) and Trent (1545-63). Note that this doesn’t mean we started believing in a place of purification at that time, just that that’s when the Church formalized the teaching. The basis for our belief can be found in the Old Testament (2 Maccabees 12:46). Throughout Church history, councils have often dealt with heresies by officially spelling out our beliefs. Obviously they felt that there were too many people spreading false teachings on the subject. You may recall from an earlier post that Martin Luther’s translation of the Bible left out seven books because they didn’t support his teachings. 2 Maccabees was one of those books. So, what exactly is purgatory? It’s a place where we go to be purified so we can enter into the happiness of heaven. In second Macabees Judas and his men made atonement for their comrades who had sinned, “Thus he made atonement for the dead that they might be freed from this sin.” The idea of praying for the dead is nothing new. Even our protestant brothers and sisters have funerals and pray for the deceased. OK, what about these indulgences? d) pray for the intentions of the Supreme Pontiff. You can obtain this indulgence no more than once a day. You may ask, “If a plenary indulgence frees me from the temporal punishment for all of my sins, why would I want to get it more than once? That’s the cool thing. You can apply your indulgence to anyone who’s died. You can get a plenary indulgence for yourself, then for mom and dad, grandma and grandpa, or anyone else who has passed away. It’s kind of a get-out-of-jail-free card that you can share with anyone you like. Remember that indulgences are only applied to purgatory. If you don’t die in a state of grace, all the indulgences in the world won’t do you a bit of good. Remember, too, that the indulgence applies only to your past sins. Any future sins will need to be taken care of later. You can see why this practice could lead to some abuses, which is what was going on in Martin Luther’s day. A rich person could approach an unscrupulous bishop or priest and offer money for a indulgence. Sadly, this was a common practice and it gave rise to the idea that Catholics could buy their way into heaven. But, and this is important, an indulgence is worthless to someone who hasn’t had their sins forgiven. It might get you into heaven sooner, but it won’t get you out of hell. To deal with this popular myth, we have to look at a little history. In the early days of the Church, there was no Bible. Everything was handed on by word-of-mouth. Because the early Christians generally believed that Jesus was coming back sooner rather than later, nobody saw the need to write anything down. As time passed the folks decided that maybe there should be some written documentation of Jesus’ life. Unfortunately, many of the people who wrote about Jesus and His Church weren’t divinely inspired, kind of like bloggers today. Since it was the Catholic Church that originally declared what books make up the Bible, it’s hard to see how anyone could think the Church added books. The fact is that the Church added all the books. So, what happened? It’s fairly simple. The books in question didn’t support some of Martin Luther’s ideas. So, when he published his protestant Bible he left them out. It was the protestants who changed the books of the Bible, not the Catholics. Biblical scholars can point out any number of New Testament passages that cite the seven books in question. James Akin gives an excellent explanation of all this in his article, Defending the Deuterocanonicals. I recommend it to anyone looking for a more in-depth explanation. Remember that it wasn’t until 500 years ago that any of this became an issue. From 393 A.D. until the 1500s, there was no question of what books belonged in the Bible. It was those wacky protestants, particularly Martin Luther, who started the kerfuffle. Coming up…Why do we need all those “man-made” rules? Isn’t the Bible enough? First a disclaimer, SOME Catholics don’t read the Bible. Neither do some protestants. Some Jews don’t read the Torah and some Muslims don’t read the Koran. But a blanket statement that Catholics don’t read God’s inspired word is just wrong. One thing that makes it appear that we are Bible-less is that we don’t bring our Bibles to mass. 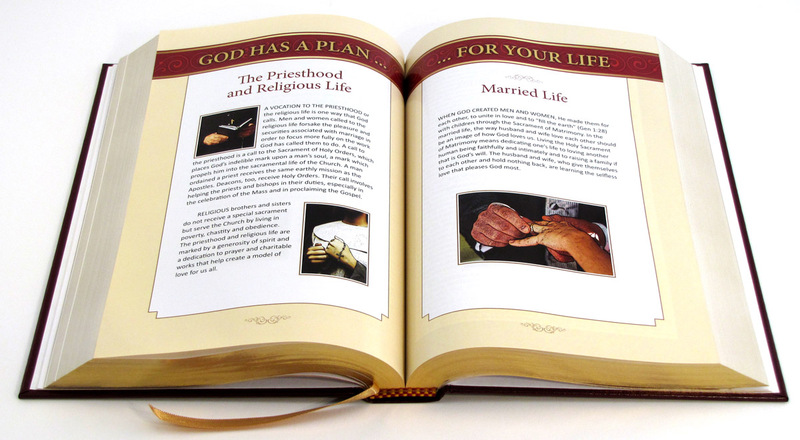 Unlike many protestant denominations, the Church provides us with a handy book called a “missalette” that contains all the Scripture readings for each week. All we have to do is to open the book to today’s date and there’s all you need. Many protestant churches, on the other hand, expect their members to tote their Bible with them to church. Then the preacher will tell them where to turn in the Good Book to follow along with him. I remember growing up in the Baptist church that it was considered a real milestone when you learned to name all the books of the Old and New Testaments in order. It was an important skill to learn because when Pastor Bob tells you to turn to the third chapter of First Corinthians you’d better be quick about it. If not, he’ll go on without you. As far as day-to-day reading of Scripture goes, the Church encourages us to spend as much time at it as we can. Whether you do or not is up to you. Another rap you may hear on the Church is that she used to chain the Bibles down in the Church. That one’s actually true. But here’s the deal. Before Gutenberg invented movable type all Bibles were copied by hand. It took a very long time and a local church was lucky to have one. They couldn’t just be left lying around where someone might steal them. The other thing is that most people couldn’t read. If you can’t read you really don’t need a Bible (or any other book). Remember that Gutenberg and Martin Luther came along at about the same time, so the Churches that were chaining down the Bibles were Catholic Churches because in those days Catholic meant Christian and Christian meant Catholic. If you’ve ever studied a Catholic Bible you’ve probably noticed that there are a lot of footnotes; a lot of explanations. That’s because the Bible, like any other book is open to interpretation. Printed words (like this post) may be read more than one way. Plus, unless you read Greek or Hebrew, the Bible that you’re reading is translated from its original language. So, to make sure that people were following an accurate translation, and that they were getting the proper interpretation of the Scriptures, the Church preferred that the people got their scripture at mass, not from some weird translation. Yes, at one time some translations of the Bible were on the Church’s list of banned books. These were inaccurate translations usually missing those seven books I talked about earlier. So, it’s too late to make this long story short, but I’ll wrap it up by saying that yes, Virginia, Catholics are encouraged to read the Bible. Some may be more faithful readers than others, but most of us read it and enjoy it. 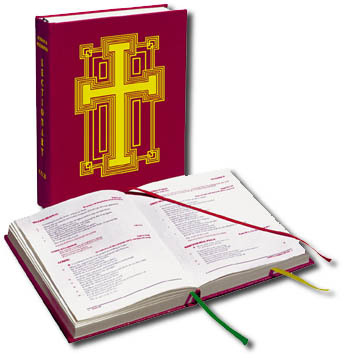 Even if we don’t read the book ourselves, over the course of a three year cycle, regular attendees will have the entire Bible read to them at mass. Coming up: About those seven books. Some of our protestant brothers and sisters refer to themselves as “Bible Christians.” I suppose they do that to differentiate themselves from “non-Bible Christians”. That would be us. There’s a wide-spread myth that Catholics are not Bible readers. I’m sure you’ve heard some people criticize us saying that Catholics don’t own Bibles, or that we own them but don’t know where to find them. On the surface, this myth may have some basis in truth. But, lets look at the facts. Some faith traditions give the minister the freedom to choose his own readings. Face it, there are an awful lot of readings that nobody would use if they didn’t have to, so these ministers tend to focus on a limited selections of readings. The prayers of the Liturgy of the Eucharist are very Biblical. The words of the Consecration are taken directly from Scripture. The Our Father and the Lamb of God are straight out of the New Testament. We’re constantly exposed to the depth and meaning of the Word of God. Of course, we’re expected and encouraged to explore the Bible on our own through personal and group Bible studies. You are likely to run into a couple of arguments from your “Bible Christian” friends about Catholics and the Bible. 1. ” Catholic Churches used to chain down the Bible so the people couldn’t read it.” As I wrote just two days ago, prior to Gutenberg’s invention of the printing press, all books (including the Bible) were very rare and expensive. Plus, there weren’t a lot of people who knew how to read. If a church was lucky enough to have a copy of Sacred Scripture, the wanted to be sure they kept it. Saying the Church discouraged Scripture study by chaining down the Bible is like saying the bank discourages financial transactions by chaining down the pens. 2. “At one time Catholics were forbidden to read the Bible.” Once Martin Luther opened the flood gates, there were a number of new, unauthorized translations of the Bible. By this time more people were learning to read but they might not have had the education or the experience to discern whether something called “The Bible” was the real deal. To protect the laity from being sold a bill of goods, the Church insisted that they get their Word of God from the Church. The bottom line is that every Catholic should be familiar with the Bible. We’re encouraged to dig into the Scriptures. But if all you do is go to mass every Sunday and Holy Day, you will know what the Bible says. Sidebar: To be a “Bible Christian” you don’t have to know what Scripture says, you just have to know where everything is. In a typical sermon, the minister will say, “Turn to the sixteenth paragraph of the third chapter of the Book of John (today’s Gospel, by the way). Then he’ll read it to you. If you haven’t been practicing, by the time you find your place, he will have moved on. In 382 AD, Pope Damasus laid out the books of the Old and New Testament. The same listing was promulgated at the Synod of Rome in 382, and again, at the regional councils of Hippo (393) and Carthage (397, 419). There were, and still are, 46 books in the Old Testament. When Martin Luther published his German translation of the Bible in 1517, he left out seven books. Why would he do that? Because the books in question didn’t line up with his new theology. At the Council of Trent in 1546 the Church reiterated her position on which books belonged in the Old Testament. Some protestants will point to Trent and claim that the Church added books in 1546 which just isn’t true. The books missing from Luther’s Bible were: Baruch, Sirach, 1 and 2 Maccabees, Tobit, Judith, Wisdom. There’s an excellent article at Catholic Answers that goes into more detail about who did what and when, but the bottom line is that many of our protestant brothers and sisters are missing some pretty good stuff. Tobit is one of my favorite books of the Old Testament. We Catholics refer to the seven books as deuterocanonical, a good word to know for trivia night. It means books that weren’t included in Hebrew Scripture but that are part of the Septuagint (The Greek version of the OT). Some of our non-Catholic brethren refer to them as apocryphal, a more negative term that means “of doubtful authenticity. The Catholic Church has recognized all of the books of the Old Testament since at least 382. Your Bible is complete. Nothing is missing. Indulgences have been around for a long time, but I suspect that a lot of people, even Catholic people, have a hard time understanding how they work. So I went to the Catechism of the Catholic Church (CCC1471-1479). The opening paragraph of the section on indulgences is a paragraph-length sentence that’s clear as mud. Here’s how it was once explained to me. Pretend your a child. You’re playing ball and you break your neighbor’s window. That’s a sin. As all good parents do, mom and/or dad tells you to go to the neighbor and tell her you broke the window. That’s confession. The neighbor says “That’s ok. I forgive you.” That’s reconciliation. But you still have to pay for the broken window. The neighbor agrees that you can satisfy the debt by cutting her grass. That’s an indulgence. It’s a simple-minded explanation but I think it works. In our world, we commit a sin, we confess it to the priest, and we’re forgiven. But there’s still that “stain of sin” on your soul. That’s what purgatory is for. You enter purgatory free from sin, but your soul isn’t clean. After a certain amount of time, your soul is clean enough to enter heaven. The cleansing process is called “temporal punishment”. The root of the word temporal means time. Each sin has a certain amount of time attached to it. Unfortunately (or maybe fortunately, depending on how you look at it) we have no idea how much time is attached to each sin. Imagine if you died and went to purgatory and the first person you met was Saint Peter. That would be very depressing. One way of cleansing the soul is through good works. Some people are so virtuous that their good works are far more than they need for their own salvation. The excess is called the “Church’s treasury.” These “excess graces” (my term) are stored up for you and me. Imagine the virtues of Jesus Christ, the Blessed Mother, and all the saints. Through them there is an infinite store of graces that you and I can share in. On the other hand, it’s possible for us to obtain indulgences and give them to someone who has died, helping them cleanse their souls. There are two types of indulgences. Plenary indulgences wipe out all of your temporal punishment. Partial indulgences, as the name implies, only wipe out some of your temporal punishment. Because time is a human concept, we have no idea how much time we spend in purgatory or how much time an indulgence is worth. An indulgence is obtained through the Church who, by virtue of the power of binding and loosing granted by Jesus, intervenes in favor of individual Christians and opens for them the treasury of the merits of Christ and the saints to obtain from the Father of mercies the remission of the temporal punishments due to their sin. So, where do I buy these indulgences? In the past indulgences have gotten a bad rap because some unscrupulous clergy use to sell them. The sale of indulgences was one of the things that got Martin Luther so worked up that he nailed his 95 Theses on the Cathedral door. You can’t buy an indulgence. You can earn an indulgence in a lot of different ways. As I mentioned yesterday, praying the Stations of the Cross is one way. I’m not going to take the space here to list them all. The Catholic Encyclopedia has an excellent article on the subject. But it is worth mentioning that you are probably earning indulgences every day and don’t even know it. For instance, reading the Bible earns a partial indulgence. So does making the Sign of the Cross. Reading this blog might even be worth a few seconds. Catholic Answers has a good article on myths about indulgences along with a partial list of them. Here’s the thing. If you get a chance to earn an indulgence, especially a plenary one, jump on it. Being able to reduce or even eliminate your time in purgatory with indulgences is super cool.